Food trucks of yesterday were thought as dingy, unhealthy and unsustainable. 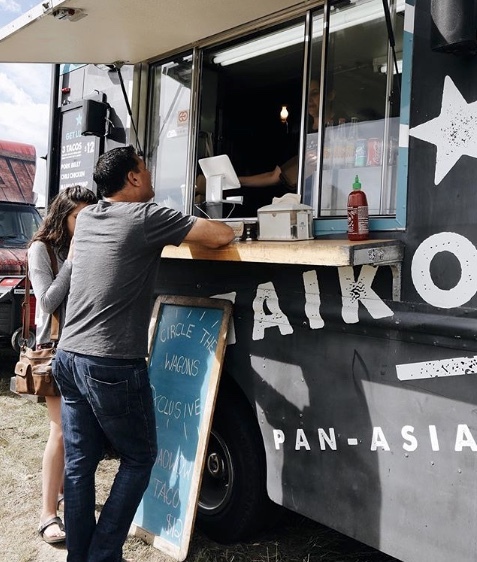 Over the last few years, food trucks in Canada and the U.S. have resurfaced and become a sought-after alternative to the brick and mortar restaurant. Today, food trucks are serving unique culinary treats that differ greatly from the traditional hot dog stand or sandwich truck of yesteryear. Many food trucks are changing from burgers and sandwiches, to offering healthy, fresh and even local foods. Many mobile restaurateurs are also looking to keep their trucks as green as possible, but this presents some challenges. Food trucks are mobile, so they use fuel and emit greenhouse gases. So how can a food truck be "green"? As most items at food trucks are take out, waste becomes a major issue and a primary focus in making a food truck more sustainable. Reducing the amount of waste created, choosing environmentally-preferred take out wares, and disposing of waste in the most responsible manner becomes key. • Have a small scale composting, recycling, and waste system both inside of the truck, as well as for the customers. • Fuel your truck with biofuel and donate grease to biofuel companies. • Offer environmentally preferred utensils and take out containers to customers. Find a brand that is made with 100% recycled materials, paper-based or is compostable (where facilities exist). • Choose truck location close to a shelter or soup kitchen where extra food can be donated if the municipality permits. Also, store the truck near local compost and recycling facilities. • Purchase as much food locally as possible. Another advantage of using local growers and businesses for food is reduction in packaging. Bringing back the containers and boxes that you purchased your food in from the grower, so they can reuse it for your next order. • Offer different portion sizes for varying appetites to cut down on the amount of food that's wasted. • Encourage your customers to bring their own take out containers by offering a small discount. • Offer bulk squeeze bottles or shakers for condiments rather than individual condiments. • Offer water bottle refills on filtered municipal water rather than selling bottled water, and sell beverages in plastic-free (glass or aluminum) containers.